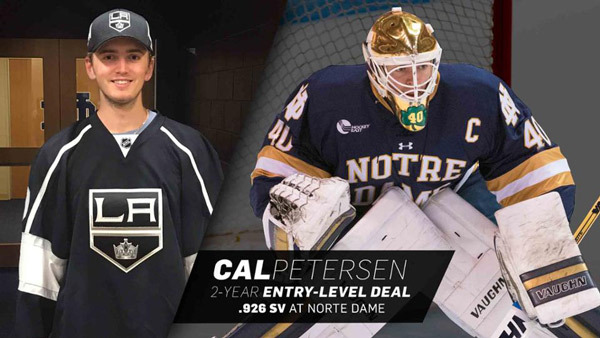 The Los Angeles Kings have agreed to terms with unrestricted free agent goaltender Cal Petersen on a two-year entry-level contract, Kings Vice President and General Manager Rob Blake announced on July 1. “We had a hole in our goaltending depth and we feel our success in development is well documented and our scouting staff and our goaltending coaches strongly believe Cal stood alone at the top of our list. We are ecstatic as he is significant to the future of our organization,” Kings Assistant General Manager Mike Futa said. The 22-year-old Petersen (born Oct. 19, 1994) is a 6-1, 182-pound native of Waterloo, Iowa who appeared in 40 games during his junior year this past season with the University of Notre Dame (NCAA), posting a 23-12-5 record, .926 save percentage, 2.22 goals-against average and six shutouts. Petersen ranked first in the nation in minutes played (2,375), tied for first in shutouts, tied for fifth in wins and 11th in save percentage. He helped Notre Dame post the 12th best team goals-against average in the country. Petersen was also the first goaltender in school history to serve as captain of the Irish. He was named team captain at the beginning of his junior year. During the 2017 regional playoffs, Petersen stopped 58-of-62 shots (.935 save percentage) against fifth seeded Minnesota and fourth seeded University of Massachusetts-Lowell in the regional semi-finals and finals respectively, helping the 12th seeded Fighting Irish into the Frozen Four. Notre Dame fell to the eventual National Champions, Denver, in the Frozen Four semi-finals. Upon completion of his college season, he was named to Team USA’s 2017 World Championship roster, but did not appear in any games. Selected by the Buffalo Sabres in the fifth-round (129th overall) of the 2013 NHL Draft, Petersen has appeared in 110 games over three seasons with the Fighting Irish, posting a 55-39-15 record, .924 save percentage, 2.30 goals-against average and 11 shutouts. He was named to the Hockey East First All-Star team for the 2016-17 season, the Hockey East Honorable Mention All-Star Team for the 2015-16 season and the Hockey East All-Rookie Team for the 2014-15 season. In the Hockey East playoffs during his freshman year, Petersen set an NCAA Division 1 record (still stands) making 87 saves during a five overtime loss to the University of Massachusetts-Lowell. He topped the previous record of 82 saves that was set by Boston University goaltender Don Martin in 1924-25. That game also went down as the longest game in college hockey history (151:42). LA Kings Season Ticket Memberships for the 2017-18 season are on sale now, deposits are also being accepted for Groups of 15 or more and Private Event Suite rentals. Individual ticket sales information for the 2017-18 season will be released at a later date. Call 1.888.KINGS.LA or visit lakings.com for more information.